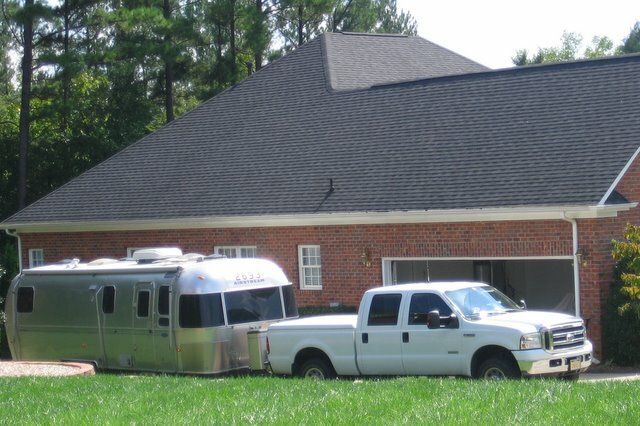 Jerry’s and Ann’s truck and trailer are in their driveway again. We arrived today at half-past two and found Jerry and Ann sitting in the shade in their driveway, cooling it. I backed their Airstream and truck into the back of their driveway and Debbie backed ours to just in front of Jerry’s and Ann’s. Today we had a short drive, less than 200 miles, from Westport Tennessee to Belmont, NC. We’re grateful and relieved to be here. It’s great to see Ann & Jerry again, and wonderful to have safely brought both trailers and trucks back to NC. We’re going to stay a few days with Jerry and Ann before we leave for our WBCCI Carolinas Unit rally at Cross Country RV Park. It’s great to be back in NC! This entry was posted in Traveling. Bookmark the permalink. We are so grateful that you have arrived safe and sound!! You have been in our thoughts and prayers as have Jerry and Ann. You will be my current example of “doing the right thing” (not the easiest but the right).You have honored your fellow Airstreamers and fellow Christians by your example. Thank you. Hugs to you both and to Ann and Jerry. As we were driving thru Oklahoma city I kept asking Rich if we had a flat tire!! really bumpy. We also had no reservations as we wended our way home .Were planning on staying in a KOA but it had closed permanetly 3 weeks ago. We ended up driving 4050 miles and staying at a casino RV park past Tulsa.